The never ending cries of car horns and the random bawking of the street chickens had only just begun by the time I awoke in the early hours of the morning on March twenty-sixth. It was an exciting day, probably the day I really looked forward to the most out of all of them on this two week trip. I was finally going to get to Ha Long Bay, a place I had seen in travel shows and on various travel websites across the internet. A place that I couldn't experience anywhere else, a natural formation found no where else in the world. 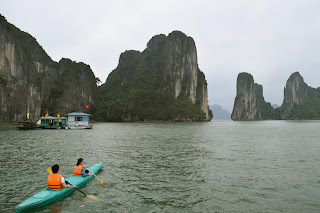 I'm unsure, really, where I first learned of Ha Long Bay. For years I have dreamed of sailing through it's limestone karsts, thousands of them emerging from the water like some strange mythical beings. Perhaps it was a post on Reddit that brought it to my attention, or maybe some sort of documentary features natural wonders of the world. All I know is that is has been near the top of my list of "must-see" places in the world, along with Angkor Wat (check!) and Machu Picchu. It was honestly one of the main reasons I had come to Vietnam, let along Hanoi. And I didn't mind having to wake up with the sun in order to see it. I had a long day ahead of me, the drive out to Ha Long Bay would be at least four hours, as Hanoi isn't that close to the coast and highways aren't really a "thing" in Vietnam yet. I had debated for months if a day trip would be enough, and looking back I would say that it was definitely worth it. There were a number of other packages you could choose from outside of the day trip that me and my friend eventually decided on, ranging from two days and one night to over a week. I honestly can't see more than two days out there being worthwhile, Our one day trip was around $60, if I am remembering correctly, and the multi-day trips are all $100 plus dollars. We were picked up right on time and our tour guide was a young, energetic Vietnamese man. After a brief trip around the city to pick up our fellow cruisemates we were on our way to the Bay. The guide we had was very knowledgeable and seemed to really enjoy what he was doing, and I believe that in this sort of situation the tour guide can make or break the experience. I learned a lot about Vietnamese culture, about the four sacred animals (turtle, dragon, phoenix, and "unicorn") as well as the meaning behind some common Vietnamese city names. Four hours in a small bus isn't ideal by any stretch of the word, and midway through I thought my bladder was going to burst, but just when I started eyeing my water bottle as a source of relief we pulled into the definition of a"tourist trap". 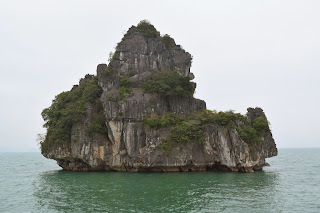 I am from Orlando, Florida, mind you, and I have never seen a place fit the image of a "trap for tourists" more than the rest stop we were brought to both to and from Ha Long Bay. Inside is dozen of women creating these (amazing) woven pictures, along with other gimmicky souvenirs. You have to walk the entire length of the building, coming out the other side to a newly cleaned and gassed up bus 30 minutes later. I consider myself lucky with the group that I had for the tour. The people traveling with us to Ha Long Bay were so nice and I met one of the most interesting families, a married couple with two children (plus the daughter's boyfriend) who have lived all over the world thanks to the mother's job. The father was especially interesting to talk to, having so many insights into the world he has traveled. As someone who hopes to continue her worldly adventures into her middle years of life, it was inspiring to see a married couple able to do that, along with their very well adapted and well rounded children. The son, an early teen that was currently on remote schooling while they lived in Kuala Lumpur, spent almost the entire ride talking about Lord Of The Flies with his newly college-aged sister. 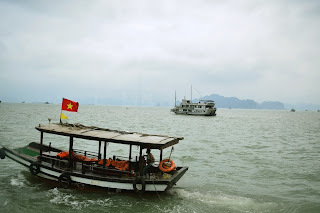 At roughly midday we arrived at the port of Ha Long city, the area surrounding the harbor was showing definite signs of development. 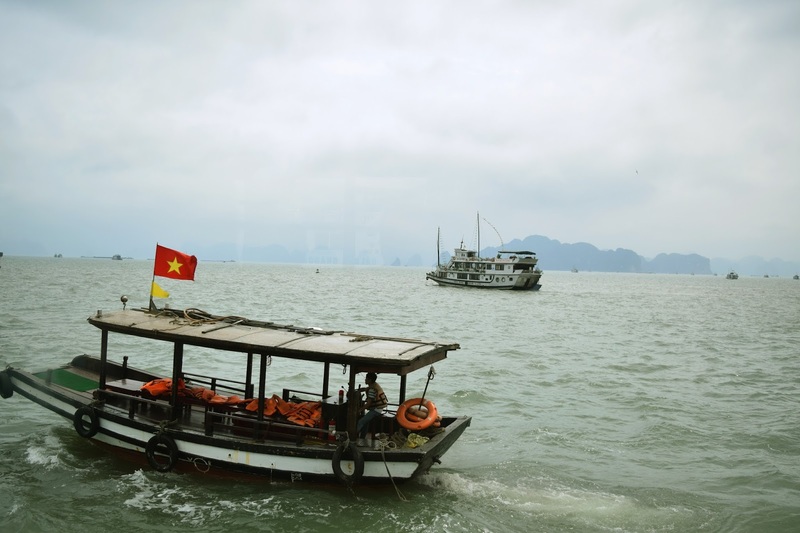 The hopes of making Ha Long Bay a standalone destination for vacation rather than a day trip from Hanoi were everywhere you looked; a newly opened movie theater, resorts under construction, billboards in English. The docks were busy and full of life, the boats varying in size and color, all with one goal in common - get as many tourists around the bay as possible. It was a bustling center and I found myself wondering off to test out my camera. It didn't take long for us to get our tickets and board a tiny, tiny little boat that was to ferry us to the larger day cruiser we would have lunch and explore the bay on. Apparently the boat was too big to fit into a docking station so we had to brave the slightly choppy sea in a slightly sketchy looking vessel. But thanks to good fortune we survived and I happily jumped onto the boat I would call home for the next few hours. Little did I know this was only the beginning of my boat parkour during this trip, I believe my trip to Tonle Sap completely removed any fear of boat hopping I once possessed. As a related aside, I had a bit of anxiety when I booked this tour. I grew up on a small peninsula in the large peninsula of Florida. The small suburban city my parents live in resides in the middle of the lake so boats and jet skis are nothing new to me. It wasn't until I visited the father of an ex-boyfriend and joined them for a day of deep sea fishing that I learned of my greatest weakness. As I sat on the floor of the fishing boat, hugging my knees to my chest and getting battered my rouge mahi-mahi while hoping the Divine Force Of The Universe would deliver me safely from this hell I was living in I learned that I get seasick. Not the, "hold one while I go feed the fishes" kind of seasick but the "I would give anything to vomit but sadly I cannot do anything but feel awful". Even Dramamine didn't do much to aide in the misery that is deepsea travel to my insides (I tried that months later when we visited again). Due to this fact I was very, very nervous that I would spend my dream day huddle in a corner of the ship while my dreams little drifted by me. I love being on the water, I love swimming, I love boats, I love the ocean. My first memories are learning to swim and nothing is better that a sea breeze across my face. Our trip out into the bay was spent eating up some fantastically wonderful food, I didn't eat too much thank to the issue mentioned above (though it was more due to the fact that I didn't want to risk upsetting my stomach and less of the fact that I felt motion sick). The food really was fantastic, and we were given a lot of it. I was impressed. Once we were done eating the group of us went to the top deck of the boat to view the first of the karsts. The day was overcast and a lurid mist shrouded the bay, which actually gave it an otherworldly effect. While a blue sky would have been nice, the gray skies provided a nice ambiance I didn't mind. We spent a while driving through dozens of the tiny islands, and I found myself overwhelmed by the fact that I Did It. I had made it here and I was in one of The Places. And in less than a week I would be in Angkor Wat. It was at this point that the fact of me being on this trip really sunk in, that I truly felt like I was Here Now. 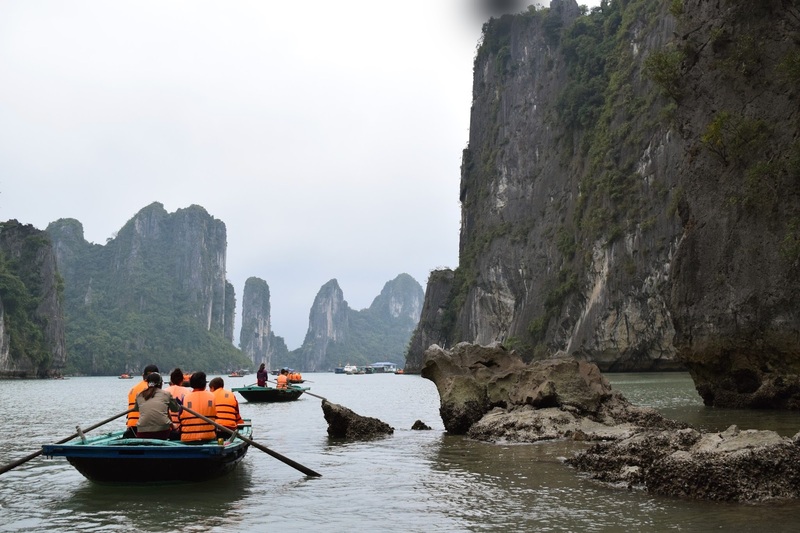 After a few minutes of slowly making our way through the limestone formations we made it to a tiny floating village. For an extra few dollars we could either take a kayak trip around two of the larger karsts or have a local woman ferry us around the same area. Due to my laziness and my desire to take pictures I opted for the latter option. Also I am probably the least coordinated person that you have ever met. Regardless, the second scary boat hop happened of the day and I was situated on a handmade boat with some middle-aged Asians and a Vietnamese woman whose arms must be stronger than any of the guys I know. The boat ride around the karsts was great, and it was awesome to get so close to the islands. We went through a few small tunnels and were even serenaded by some local woman's singing. I believe she was pregnant. And rowing a boat. Afterwards we were ushered back onto the boat and then taken to a very large limestone island. After jumping onto one on of the same small ferry boats that took us from the docks we disembarked onto our final site in Ha Long Bay. A Giant Cavern Whose Name I Have Forgotten. At this point being on non-moving ground was very strange. But the cave was awesome and lit up by really colorful lighting. We made our way through it and our tour guide proved, again, that he was awesome and full of knowledge. After we were all safely back on the boat we began to head back towards the harbor. 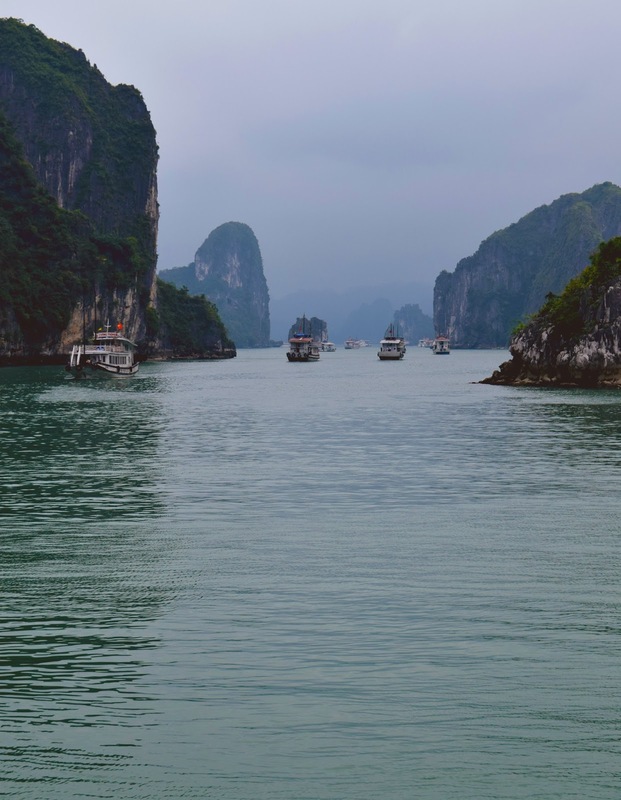 Our time in Ha Long Bay was over and I was filled with a happiness that I can only feel while traveling, and it is a reason I will do it for as long as my body can manage. I also practiced my selfie game, since I seriously lack the ability to take a decent picture of myself in that fashion. I'm still not very good at it. 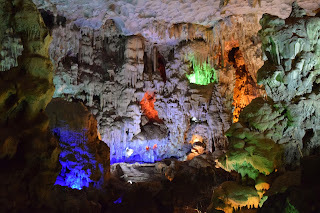 We arrived safely back at Ha Long City and piled into the minibus, I was equal parts tired and excited and the drive back to Hanoi went quicker than the drive to Ha Long Bay, and over 12 hours after we left the hostel in the morning we were back long after the sun had set. All photos are taken by my and I hold all the rights to them. Please do not use them unless given permission to directly from me. Thanks! !